Inner Wheel Club of Hailakandi organised a host of programmes as run-up to the 150th birth anniversary of Mahatma Gandhi. The highlight was the self defence awareness programme for girl child arranged at Graham MV School, where taekwondo instructor as well as Rotarian Bibhabhushan Chakraborty discussed the finer techniques and demonstrated the different skills of self defence with the help of his students. President, Inner Wheel, Tanushree Chanda and vice president Kabita Das underscored the importance of self defence for girls in the wake of crimes against women. The instructor as well as principal of the school were felicitated by president Chanda and cub members Moushimi Paul Choudhury Suparna Haldar and Simmee Das. Another programme was held at Kalyan Ashram, an abode for tribal girls, where Inner Wheel Club arranged a programme for health and hygiene of girl child. Handwash techniques were demonstrated and handwashes were provided to the centre. 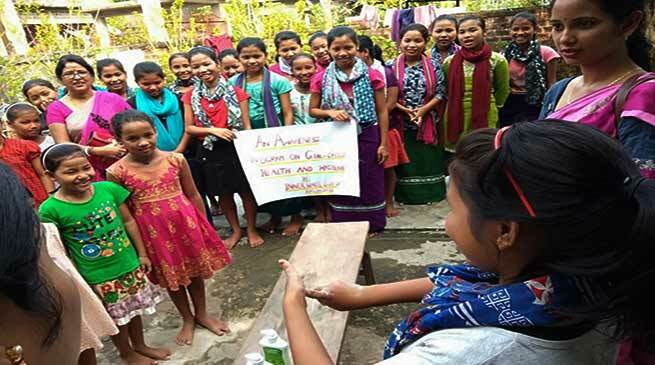 Students were asked to attach importance to handwash for maintaining health and hygiene.The girls aged above 10 years were given an awareness on adolescence period and the ways of maintaining hygiene during those period. Sanitary napkins were distributed among all the girls. President, Inner Wheel Club, Tanushree Chanda said the club aims at upliftment of women and girl child in every way and in the near future it intends to take up a slew of initiatives in this regard.